Turn on your television and you are instantly bombarded with motion, color and sound. A typical television commercial changes scene every three seconds. Volume is cranked up and flickering images and colors mesmerize. The television programs are reduced to filling between commercials. Computer games and programs follow the same frenetic pattern. Movie trailers reduce all movies, no matter what the story line, to action-adventure video games. To counter this almost constant assault on the brain, time and a place for thoughtful reflection is required. One of the best places for reflection is the string of small towns and villages that line the Napa Valley. Calistoga, one of those small towns, is peaceful, quiet and restful, particularly during the winter months. Everything in Calistoga is close together and very “walkable”. There is an alley lined with murals of scenes from the 1800s. 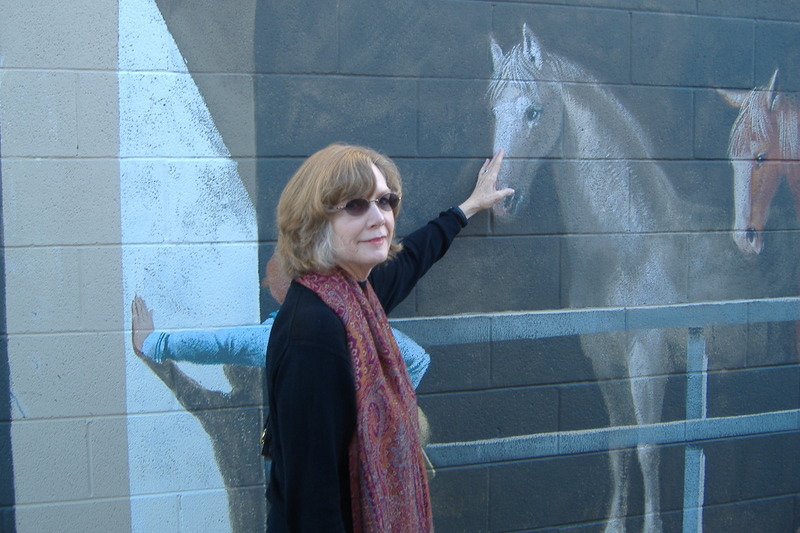 We were last in Calistoga when the artist was painting the murals four years ago. It was great to see the final product. As you walk toward the center of the town, there is an area that has several large potted trees. Each tree has a theme. One is “lost love”, another “gratitude.” Each is covered with small pink rectangles of paper tied to the branches with string. These are messages from passersby. Containers of papers and pens sit next to each tree. We spent some time reading the messages. Some have faded so badly it’s hard to read them. Others are bright and newly minted. A great place for contemplation! I’m a firm believer in the brain’s “back burner”. You can think through a problem, then place it in the back of your mind and allow the potential solutions to emerge, just as you slow simmer soup on the back burner of a stove. The solutions need quiet and reflection to emerge. My current “back burner” problem has been how to revise the story line for the second book in what I think will be a great children’s book series. I’ve completed the first book. I’ve even received my first rejection from a publisher. They actually read my manuscript, or at least skimmed it, and returned to me within thirty days with some commentary. I’m thank for that, and confident I will find a home for the series. What I haven’t yet been able to solve, by using my “back burner” is my tendency to wake up at 3:00 a.m., unable to sleep until I get up and write! Maybe I can convince myself that inspiration can (and should) strike during normal waking hours. I’ll revise the thought and put that on the back burner. Well — it’s 4:30 am as I write this. Time for sleep. Good night! I am going to very much enjoy this page. This inspires me to want to shut down a few devices, get away and do some writing myself. Congratulations! You are the first commentator and my first follower. There should be some sort of prize for that! Thanks for your comment and happy writing. I think the back burner approach is a good one. I have several manuscripts that I have set aside, giving myself some time to let the work “simmer.” But sometimes I worry that a piece I am letting simmer may lose its flavor. I guess in those cases, possibly that piece is one that may never come to full fruition, or it may be a manuscript that really needs time to age like good cheese or wine. However, I like to occasionally go through my folders of work and review old stuff, just in case there is something that is ready to be reworked.